Apartment on 3 floors in the historical center of Giuncarico with 2 seperate entrances. The room on the upper floor is organized as a studio apartment with a proper entrance, a kitchen corner, bathroom and a mezzanine floor with a single bed. On the ground floor a kitchen with fireplace and proper entrance and a small laudry room with washing machine, and on the intermediate floor a spacious bedroom with a bathroom with shower. Both rooms have a beautiful stone wall. Independent gas heating system. 20 minutes drive to Grosseto and to the beaches of Castiglione della Pescaia. 400m from the public open air swimming pool of Giuncarico. EPC rating G (221). Beautifully renovated apartment in the historic centre, composed of double bedroom, bathroom with shower, living room and kitchen corner with wood stove. Ready for installation of gas meter and gas heating system. It takes about 20 minutes drive to get to the city of Grosseto and 25 minutes drive to lovely beaches in Castiglione della Pescaia, Marina di Grosseto, Follonica or Puntone. 450m away from the public open air swimming pool of Giuncarico. EPC rating F (137). Nearly new furnished apartment with a terrace with breathtaking view. The apartment is situated in a small apartment building on three floors of six apartments and has a double bedroom, bathroom with shower and access to a small terrace with washing machine and sink, storage room, kitchen and a bright living room with panoramic view and access to the 15 sqm habitable terrace. Air conditioning and heating system with gas boiler. Second/last floor. Private parking space in front of the apartment building. 20 minutes drive to Grosseto and to the beaches of Castiglione della Pescaia or Follonica. 200m away from the public open air swimming pool of Giuncarico. EPC rating G (227). Countryside property of 3.300 sqm composed of a semi-detached house on two floors, garden, spacious shed and other smaller garden sheds. On the ground floor of the house a spacious living room with dining area and sitting area, study room, habitable kitchen, bathroom with shower, laundry room and two covered terraces. On the upper floor, the night hall with three bedrooms and a bathroom with hydromassage tub and shower. The house has an alarm system, an electric fence, air conditioning and a mixed heating system (wood burning stove and gas burning systems). Excellent EPC rating (class D - 95). Semi-detached shed of 64 sqm, a covered area of 54 sqm, and a garden shed of 24 sqm. 8 km from the main road SS1, 10 km from Grosseto and 20 km from Castiglione della Pescaia. Furnished apartment for sale in the historical centre. Bedroom with double bed and bunk beds, bathroom with shower, living room and kitchen corner with dishwasher and washing machine. Immediately habitable and for sale with furniture, kitchen and equipment included. The windows have roller shutters. 20 min from Grosseto and from the beaches of Castiglione della Pescaia. 500m away from the public open air swimming pool of Giuncarico. Ideal for holidays. EPC rating G (386). Bright apartment in the historical centre of Giuncarico on the second/last floor, to be renovated. The apartment has a spacious living room with kitchen corner, bathroom and two bedrooms. 300m from the public open air swimming pool of Giuncarico. It takes about 20 minutes drive to get to the city of Grosseto and 25 minutes drive to lovely beaches in Castiglione della Pescaia, Marina di Grosseto, Follonica or Puntone. Townhouse on 2 levels, divided in 2 separate, independent apartments. On the ground floor apartment of 165sqm with its own entrance composed of ktichen, dining room, 3 bedrooms, 2 bathrooms, and a garage. On the upper floor apartment of 105sqm with its own entrance composed of living room with open fireplace, bedroom, bathroom and kitchen/dining room with access to a 60sqm patio. Autonomous gas heating system and air conditioning. 20 minutes drive to Grosseto and to lovely beaches in Castiglione della Pescaia or Follonica. 400m from the public open air swimming pool of Giuncarico. EPC rating G (223). Nearly new furnished apartment on the second/last floor of a small apartment building on 3 floors. Living room with access to a 16 sqm panoramic terrace, kitchen and dining area, bathroom with shower and two bedrooms. Private parking space in front of the building. 150m from the public open air swimming pool of Giuncarico. 20 minutes drive to Grosseto or to the seaside (Castiglione della Pescaia, Marina di Grosseto of Follonica). EPC rating D (132). Studio Apartment located in a stonehouse in the countryside with a small private garden of about 35sqm with an independent entrance on the ground floor, a staircase which leads to the upper floor where the apartment is situated. The apartment has high ceilings with wooden beams, a kitchen corner, a bathroom with window and shower, and arched windows on 3 sides which overlook the countryside around the house. Recently renovated and in excellent conditions. 30 minutes drive to the seaside and beaches near Castiglione della Pescaia e Marina di Grosseto and 20 minutes to Grosseto. EPC rating G (364). House on 5 floors in the historical centre of Giuncarico, with a private courtyard of about 150 sqm. On the ground floor an independent apartment with two bedrooms, bathroom, kitchen and living room. On the first and second floor two similar apartments with two bedrooms, bathroom, living room and kitchen, both recently renovated. Upstairs an attic room with bathroom and a tower with terrace with breathtaking view. On the lower floor cellars and a garage. 20 minutes drive to Grosseto or to the beaches of Castiglione della Pescaia. 450m from the public open air swimming pool of Giuncarico. Outstanding EPC rating E (127). Apartment on the second/last floor of a small apartment building built in the '70s. The apartment is in good conditions and is composed of a large open space with kitchen, dining area and living room with fireplace and a big terrace, a storage room, two bedrooms and a bathroom. Independent gas heating system. On the ground floor there is another storage room and a spacious cellar and garage. 300m from the public open air swimming pool of Giuncarico. 20 minutes drive to the beaches of Castiglione della Pescaia or Follonica and 20 minutes to Grosseto. EPC rating F (104). Property for sale in the countryside of Boccheggiano with renovated stonehouse with about 4 ha of land around it. The ground floor and the first floor of in total 130 sqm are habitable and the half underground consists in 65 mq of storage rooms to be renovated. There is a new annex building of 45 sqm near the house and some extra annexes which can be rebuilt. House on 3 floors, with a impressive central staircase. There is a dining room and kitchen corner on the ground floor, and a small storage room under the stairs. On the first floor a double room, communicating with a smaller room and a bathroom with shower and another spacious room. On the second floor a spacious bedroom with en-suite bathroom with shower. On the intermediate floor on the back of the house there is a spacious bathroom with bath tub shower, and washing machine, a second kitchen and access to a marvellous patio of 25 sqm. The upper floor of 65 sqm has low ceilings but is ideal for storage room. On the ground floor there is a studio apartment with bathroom with shower with proper entrance which is communicating with the house but which is independent at this moment. The house has a gas heating system which serves all floors. Also available a garage of 25 sqm in front of the house. 5 min on foot to the public open air swimming pool of Giuncarico. 20 minutes drive to Grosseto and to the beaches of Castiglione della Pescaia. Apartment just outside the historical centre of Giuncarico, on the second/last floor in a stone building in execellent conditions. The apartment has a spacious living room with dining area, sitting area and kitchen corner with fireplace and access to the 200sqm garden with several fruit trees at the back of the house, a panoramic terrace of 8 sqm with access to the bathroom with shower and washing machine, 2 spacious bedrooms, an attic of about 100 sqm and a garage of about 50sqm. Located in front of the public open air swimming pool of Giuncarico. 20 minutes drive to Grosseto or to the seaside (Castiglione della Pescaia, Marina di Grosseto of Follonica). Furnished apartment in the historical centre of Giuncarico, on the second/last floor of a small building with 4 apartments, with a bedroom, a bright living room with kitchen corner, bathroom with shower, and a small covered terrace with panoramic view. Air conditioning. Spacious apartment on two floors for sale in the heart of the historical centre of Giuncarico. Entrance on the ground floor, two bedrooms, bathroom with shower, dining room with kitchen corner and wood stove, second bathroom, and a living room with access to a spiral staircase that leads to the tavern on the floor below. The characteristic tavern with stone and brick walls and ceilings with wooden beams has a proper entrance and is ready for installation of a small bathroom and a kitchen. 450m away from the public open air swimming pool of Giuncarico. 25 minutes drive to lovely beaches in Castiglione della Pescaia, Marina di Grosseto, Follonica or Puntone and 20 minutes to Grosseto. Ground floor 2-bedroom apartment for sale in the historical centre of Giuncarico, composed of a habitable kitchen, bathroom with shower and laundry room. On the lower basement floor, two cellars, of in total 44 sqm, with an average height of 2,70m and 2,80m, which are connected to the apartment by an internal staircase. New utilities systems have been installed and the walls have been plastered. Amongst others, floors, windows and doors have to be put in. The bedrooms have an open view of the valley and the countryside around Giuncarico. Apartment on the second / last floor of a small four-family building. The apartment of about 100sqm consists of entrance hall, kitchen, utility room, living room with a panoramic, south-exposed terrace with view of the town centre of Giuncarico, two bedrooms and a bathroom. LPG heating system. The property includes a spacious cellar and a garage. The apartment is only 250m away from the public outdoor pool of Giuncarico. 20 minutes from Grosseto and the beaches of Castiglione della Pescaia or Follonica. The villa has 5 bedrooms and 3 bathrooms, 2 kitchens and a very spacious living-room. In the 5.000 sqm garden there is a swimming pool (10x7m) with shower, fontains and jacuzzi. There are several terraces with motorized patio awnings. The access to the villa is by an asphalted road which serves several residences. San Lorenzo Nuovo is located in a corner of Lazio, near the boundaries Tuscany and Umbria and near Bolsena Lake. The surrounding hills in combination with the crater lake provide a mild climate summer and winter. The villa offers a stunning view of the lake from the top terrace. 1-bedroom apartment in a small property with a shared pool in the Tuscan countryside. The ancient farmhouse has been renovated in 2008 into 10 small apartments, most of which are used for touristic purposes. The corner apartment has a living room with kitchen corner and a bathroom with shower on the ground floor. On the upper floor a double room, a storage room and a small study room. In front of the apartment there is a private garden of approx. 120 sqm with lovely panoramic views. Grosseto city center – near train station – Apartment on the first/last floor of a two-family period house in excellent conditions in an area with little traffic. Independent access from a private courtyard of 25 sqm with an electric fence and a private covered parking space. A private staircase leads to the 122 sqm apartment on the first floor with high ceilings, which is composed of a spacious and bright living room, a dining room with kitchen, bathroom with bathtub and shower cabin, double room and single room, all with parquet floors and high ceilings. A spiral staircase leads to the attic floor, which has been completely decorated as a 57 sqm mini apartment with a new bathroom with shower, computerised roof windows with rain sensors and parquet floor. 500m by foot to the bus and train station. New apartment on the first floor for sale with spacious sun exposed terrace with stunning view on the valley and the surrounding hills. One bedroom with balcony, a kitchen separated from the living room and a bathroom with shower. Each apartment has its proper entrance, autonomous heating system with gas boiler outside the apartment, ready for installation of airconditioning and a private parking place. Immediately available. 20 minutes drive to Grosseto or to the seaside (Castiglione della Pescaia, Marina di Grosseto of Follonica). 200m from the public open air swimming pool of Giuncarico. New 2 bedroom apartment (65 sqm) with spacious sun exposed terrace with stunning view on the valley and the surrounding hills. Two bedrooms, a kitchen separated from the living room, and a bathroom with shower. Each apartment has its proper entrance, an autonomous heating system with gas boiler outside the apartment, ready for installation of airconditioning and a private parking place. First floor. 150m from the public open air swimming pool of Giuncarico. 20 minutes drive to Grosseto and to the beaches of Castiglione della Pescaia or Follonica. New 2 bedroom apartment (65 sqm) for sale situated on the ground floor with sun exposed terrace with stunning view on the valley and the surrounding hills. Two bedrooms, a kitchen separated from the living room and a bathroom with shower. Autonomous heating system with gas boiler outside the apartment, ready for installation of airconditioning, private garden of 100sqm and car port. 150m from the public open air swimming pool of Giuncarico. 20 minutes drive to Grosseto or to the beaches of Castiglione della Pescaia. New apartment for sale situated on the ground floor with sun exposed terrace with view on the valley and the surrounding hills. Double bedroom, a kitchen separated from the living room, bathroom with shower, car port and private garden of 80sqm. Autonomous heating system with gas boiler outside the apartment, ready for installation of air conditioning. 20 minutes drive to Grosseto or to the seaside (Castiglione della Pescaia, Marina di Grosseto of Follonica). 200m from the public open air swimming pool of Giuncarico. New 3 bedroom apartment with spacious sun exposed terrace with stunning view on the valley and the surrounding hills. The apartment is on the first (last) floor of a small 4-apartment building. There are three bedrooms, a kitchen separated from the living room, and two bathrooms one of which with shower. The apartment has its proper entrance, an autonomous heating system with gas boiler outside the apartment, ready for installation of airconditioning and a private parking place. Finally there is a big attic floor which is perfect for extra storage space. 200m from the public open air swimming pool of Giuncarico. 20 minutes away from Grosseto and from lovely beaches in Castiglione della Pescaia or Follonica. Prestigious house on 4 floors of 128 sqm each, composed of 16 rooms and two balconies, with a panoramic terrace of about 120 sqm, surrounded by around 2.700 sqm of slighly sloping land on which it is possible to build a swimming pool. The house is in good conditions. Completely renovated apartment on the first floor in the historical centre, composed of a living room and kitchen, with toilet, 2 bedrooms and a bathroom with shower. Ceilings with wooden beams, pellet heating system, and on the ground floor a storage room. Outstanding EPC rating D (52). 300m from the public open air swimming pool of Giuncarico. 20 minutes drive to the beaches of Castiglione della Pescaia and 20 minutes to Grosseto. Apartment in the historical centre of Giuncarico with a splendid view on the countryside, composed of 2 bedrooms, bathroom with shower, spacious living room with kitchen corner and open fireplace. The apartment is situated on hte second (last) floor of a historical stone building and is in relatively good conditions. On the first floor there is a studio apartment of 20 sqm with a bathroom and a proper entrance, which is part of the property. 450m from the public open air swimming pool of Giuncarico. 20 minutes away from Grosseto and from lovely beaches in Castiglione della Pescaia or Follonica. 1100 sqm of construction land in Castellaccia. Possibility to build up to 600 sqm of residential property. Info and price in the agency. Apartment with independent entrance on the ground floor with 2 bedrooms, a storage room, living room, kitchen, terrace (10 sqm) with access to the bathroom. Gas heating with independent gas radiators, fireplace and in the biggest bedroom air conditioning. Can be sold together with a small storage room of 11 sqm at a few steps from the apartment. 20 minutes drive to the beaches of Castiglione della Pescaia or Follonica or to Grosseto. 450m from the public open air swimming pool of Giuncarico. Apartment in the historical centre of Boccheggiano which needs to be renovated. Entrance from the town centre on the ground floor, while the back of the apartment is located on the first floor with panoramic view. The apartment is composed of 5 rooms and 2 bathrooms and needs to be completely renovated. Apartment in the historical centre, on two levels. On the upper floor, a dining room with kitchen corner, a spacious living room, three bedrooms and a bathroom with shower. On the lower floor two rooms which are registered as strage room, but whcih can be easily made habitable. In total 150 sqm plus a cellar with independent access of 30 sqm. Ideal for a big family. In fairly good conditions, habitable. 20 minutes drive to the beaches of Castiglione della Pescaia and 20 minutes to Grosseto. 500m from the public open air swimming pool of Giuncarico. Apartment in the historical centre of Caldana, situated inside the walls of the ancient castle, in perfect conditions. Double bedroom, bathroom with shower, living room with small terrace, dining room with kitchen corner, and near the apartment a spacious tavern of about 30 sqm. 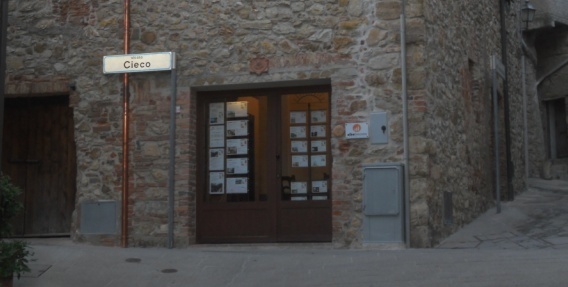 Cosy apartment on the second/last floor in the new town centre of Roccatederighi, with all services within easy reach by foot. Private entrance by an outer staircase, small laundry room under the inner staircase that leads to the apartment on the second floor. Living room sitting area with open fireplace, dining area, kitchen corner, small panoramic terrace, hallway, double room, single room, bathroom with shower. Attic with gas burner. Recently renovated. Apartment on the first/last floor, composed of a living room with kitchen corner and terrace, 2 bedrooms with view on the surrounding hills and a bathroom. On the ground floor a cellar of approx. 10 sqm and a garden of approx. 65 sqm. In good conditions. 25 minutes drive to Grosseto and to beaches in Castiglione della Pescaia e Follonica. Recently built villa on one floor, in the countryside under the village of Buriano, on slightly sloping terrain, surrounded by olive groves. The villa is composed of 124 sqm of habitation, 70 sqm of workshop, a cellar of 24 sqm and in total 5 ha of land of which 5 ha of olive groves. Entrance by a 18 sqm portico, large open space with kitchen corner, dining area and sitting area, two double bedrooms, a smaller bedroom or study room and two bathrooms. Terrace of 60 sqm of which 23 sqm need to be covered. Modern and efficient heating system with wood-burning stove. Bright apartment in the historical centre of Giuncarico, second floor, composed of spacious kitchen, two bedrooms, bathroom with shower and window, very spacious living room (40 sqm) with 3.20m high ceiling with wood stove and a small panoramic terrace. On the upper floor an attic of approx. 70 sqm with an average height of 1.20m. LPG gas heating system Riscaldamento a GPL di rete. 400m away from the public open air swimming of Giuncarico and 20 minutes drive to Grosseto, to Follonica and to Castiglione della Pescaia. Villa on 3 floors, divided in 2 similar apartments, of about 165 sqm each, both with a spacious underground garage. The apartments have a dining room-kitchen with habitable terrace of about 24 sqm, a sitting room, storage room and 3 bedrooms and 2 bathrooms. The 2.000 sqm garden is fenced and has an automatic driveway gate and there is an alonestanding shed of 120 sqm. Heating and hot water system with solar pannels. The villa is inhabited and in good condtions. Spacious apartment on the second floor in the historical centre. The apartment is on two floors and is currently divided in a living area with bathroom with shower of approximately 120 sqm on the lower floor and a sleeping area with bathroom with bath tub of about 70 sqm on the attic floor. The apartment is commensurate to the actual living standards. It has a heating system which can be used with gas or with a pellet burner and in the living room there is a fireplace. Apartment on the second/last floor of a small apartment building built in the '70s. The apartment is in excellent conditions and is composed of a large open space with kitchen, dining area and living room and a big terrace, a storage room, two bedrooms and a bathroom. Independent heating system system with a wood burning thermo-fireplace. On the ground floor there is another storage room and a spacious cellar and garage. Semi-independent house of approx. 115 sqm, recently renovated and in excellent conditions, in a typically Tuscan rural style with stone walls inside and arches, composed of living room with fireplace, dining room, kitchen and bathroom on the ground floor, and sleeping room and second bathroom on the upper floor, with access to a cosy panoramic terrace. Around the house there is outer space, parking space and land that is in common use with the houses next door. Recently built, spacious, bright and comfortable apartment on the first/last floor. Independent entrance, small private garden, large habitable terrace, living room with kitchen corner, dining area and sitting room, pellet stove, guest bathroom, double bedroom with ensuite bathroom with shower. Low condominium and heating expenses. Garage of 15 sqm. The apartment has an alarm system. 1 km from the sea and 300m from the town centre of Fonteblanda. EPC rating E.
Renovated apartment on 2 floors in the historical centre of Buriano composed of a living room with kitchen corner, a small storage room, a bathroom with window with a shower, toilet, sink and bidet, and on the floor above a double room. From both the living room window and the bedroom window you can enjoy an open view on the town of Buriano and the countryside around it. The public courtyard in front of the apartment offers the opportunity to use this space and enjoy the quiet of the town in open air. The apartment is situated in the heart of the historical centre and cannot be reached by car. The bedroom and the living room have air conditioning. Apartment for sale on the first floor of an apartment building in the town centre of Ribolla, composed of entrance, kitchen, two bedrooms, bathroom with shower and a spacious living room with terrace and storage room. Independent gas heating system, double glazing. In good conditions. Small corner apartment with independent entrance on the first floor, composed of a kitchen-dining room, living room with wood stove and double bedroom. On the attic floor, which has the same surface of the entire apartment, max. height 2m, and which is accessible by a ladder from the living room, there is the installation of the heating pumps, the electric boiler and an extra water tank. The apartment has insulation panels on the inside of the walls. Apartment on the first floor of an apartment building in the centre of Ribolla with a living room with kitchen corner, bedroom and bathroom with bath tub. Independent gas heating system, furnished and in good conditions. EPC rating G (285). Prestigious stone house with garden in the centre of a small town on the Tuscan hills. On the ground floor an entrance, sitting room with wood oven, bedroom, living room with kitchen, access to the garden, storage rooms. On the first floor, entrance, kitchen, bathroom, spacious living/sitting room with fireplace, access to a big terrace with view on the surrounding countryside and hills and seaview (25 km. away). On the second floor 3 bedrooms and a bathroom. 300m from the public open air swimming pool of Giuncarico. 20 minutes drive to the beaches of Castiglione della Pescaia and 20 minutes to Grosseto. Possibility to purchase only the ground floor (135 sqm + garden ) or the first and second floor together (230 sqm). EPC rating F (225).